1865 New Hartford Sep Sun. 10 Went to Church. Eld. Orcutt Preached at S School. C R Harmon here P.M. went for plums Mon. 11 We slept in barn I went with team to Henry & cut hay 3 lds broke machine Tues 12 Pa & I at Henrys he "[drove?]" home 1 ld hay A.m. I put up with lady Dell & drew 2d. 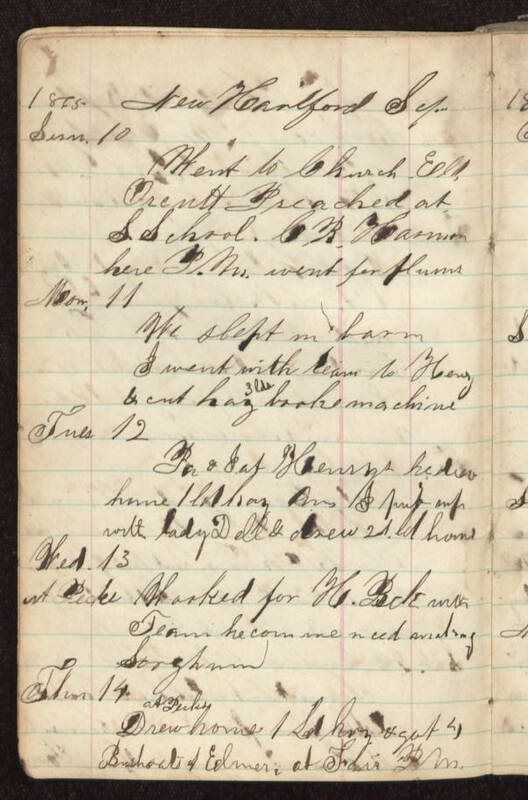 ld home Wed. 13 at Pecks Worked for H. Peck with Team he commenced "[sweating?]" Sorghum Thur 14 at Pecks Drew home 1 Ld hay & got 4 Bush oats of Elmer. at Fair P.m.